You’d think the Devil would serve as a more obvious scapegoat for the atrocities that have recently dotted Europe and America, but “God”—most often referring to the monotheistic deity of the Abrahamic faiths—has been cited as a prime inspiration for acts involving cold-hearted murder and bloodshed, whether it be a coordinated attack on a metropolis or an abortion clinic. Ancient scriptures describing all-powerful beings and their effects on violence today is a topic for a different article—possibly one that doesn’t belong in a publication devoted to comic books. But the situation is what it is, and means we live in an era potentially primed for The Devil to enjoy a resurgence in popularity, because all the awful people are apparently big God fans, no matter how misguided. Thus, Satan’s getting a new Fox primetime series that’s terminally reminiscent of Bones and Castle. He’s also getting a fresh comic. 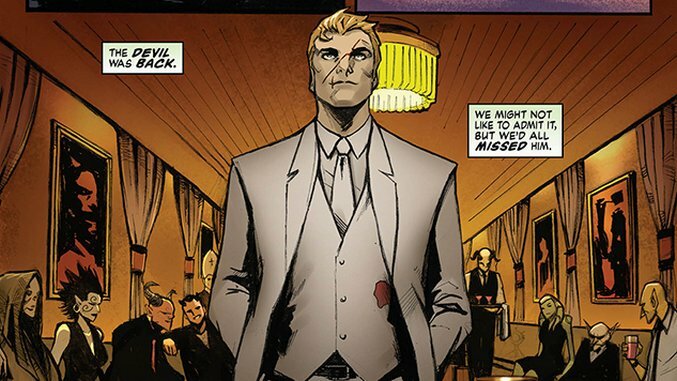 Not that there’s anything revolutionary about sympathetic depictions of the Prince of Lies—in the case of the comic, Vertigo has enlisted writer Holly Black and artist Lee Garbett to forge a sequel to Mike Carey’s Lucifer from the ’00s, which was itself a spinoff of Neil Gaiman’s wildly lauded The Sandman, in which the Morning Star is depicted as irresponsible, though perhaps not entirely villainous. Black immediately kills off the Almighty, thus preemptively dialing down his role in what unfolds. God is dead—or so it appears—before Lucifer can even get off the ground, which it barely manages in its premier issue. Every first issue of every comic series ever, by definition, serves as an advertisement for the second installment. But this series’ initial book identifies itself as a jumping-off-point much more overtly than it should. In the hands of an unskilled wordsmith, this comic would’ve played out as a profound snoozer, but Black’s dialogue flat-out dazzles. Reading the first issue of Lucifer is kind of like drinking Pabst Blue Ribbon out of a ruby-encrusted crystal chalice—there’s nothing wrong with PBR, necessarily, but it’s a predictable experience we’ve all had before, and it’s unworthy of its own top-notch packaging. Garbett’s art feels perfectly competent, workmanlike, which might be a good thing, depending on how future Lucifer issues pan out. Evil Incarnate often has an easier time doing its job when it appears a little understated. I can’t plainly state my gripes with this book without sinking into spoiler territory, so fair warning, SPOILERS follow. In Lucifer #1, Metatron (the angel who once spoke for God) recruits fellow angel Gabriel—who has developed a nasty alcohol problem since being discharged from his former heavenly post—to track down and smite God’s murderer. Sending a clearly traumatized and useless wino to suss out and confront whomever undid the maker of all creation sounds like an awful plan…unless, of course, you already know good and darn well what happened to God, and your ramshackle secret agent’s success would interfere with your sinister ulterior motives. 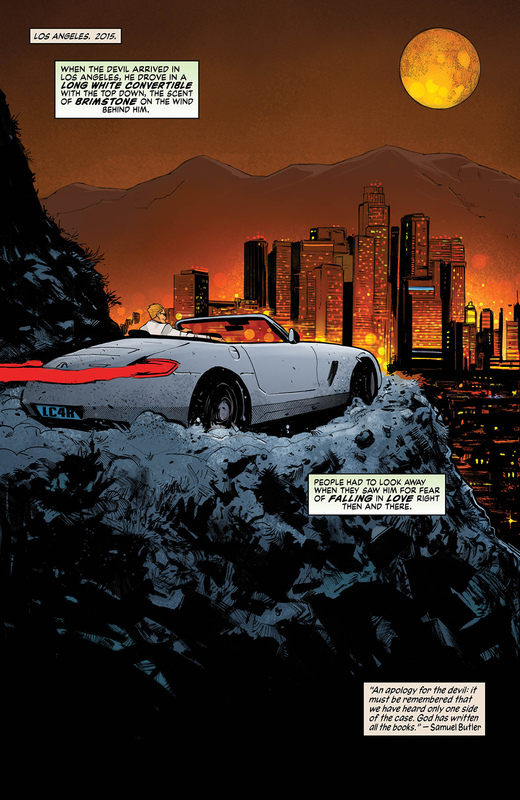 Nothing in Lucifer directly hints at Metatron’s deception, but it would be downright shocking if he turns out to be on the up-and-up later in the story, which would be a shame, as “The seemingly-benign authority figure is actually the bad guy” trope has been rigorously played out in plenty of prior supernatural adventure yarns. 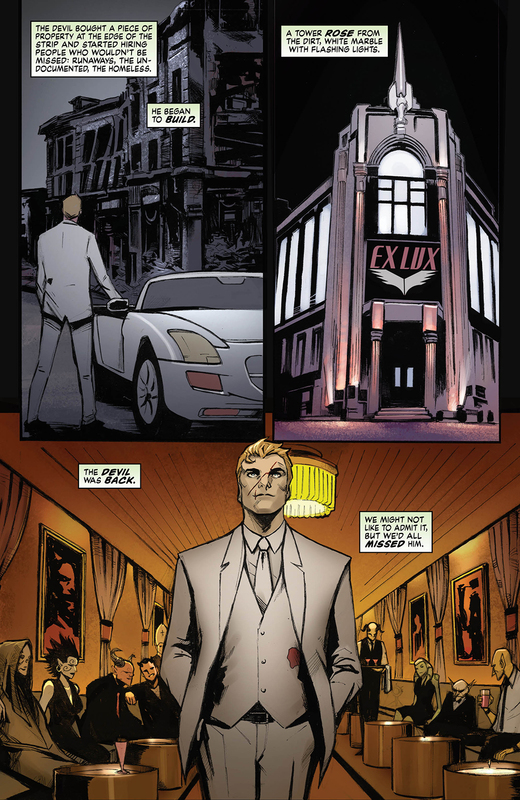 Assuming the most obvious suspect must also be the guilty one, Gabriel proceeds to pounce on Lucifer, who’s newly returned to Earth and reopened the Lux nightclub. After a brief scuffle, Lucifer tells Gabriel that he’s got the wrong man, but he’ll help him find the right one, because moral ambiguity. 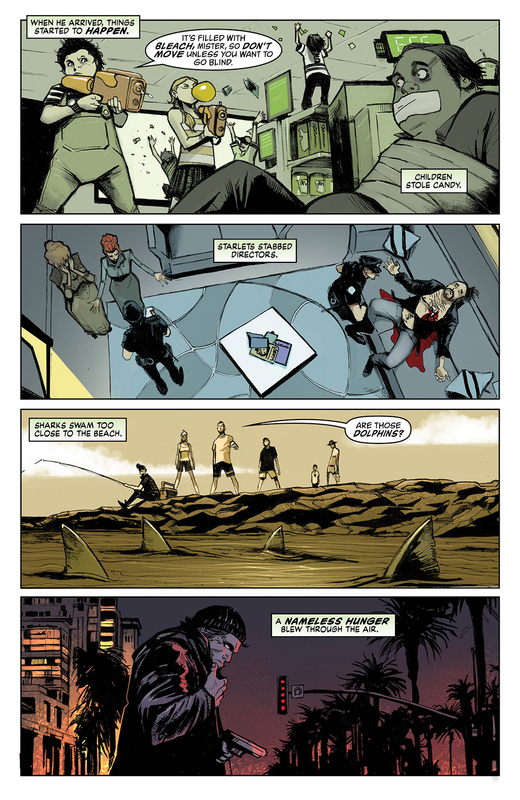 Within roughly 20 pages and with little resistance, Gabriel accepts orders from a severely shady alpha Angel, and then decides to believe the literal Prince of Lies. Gabriel is very easy to manipulate. 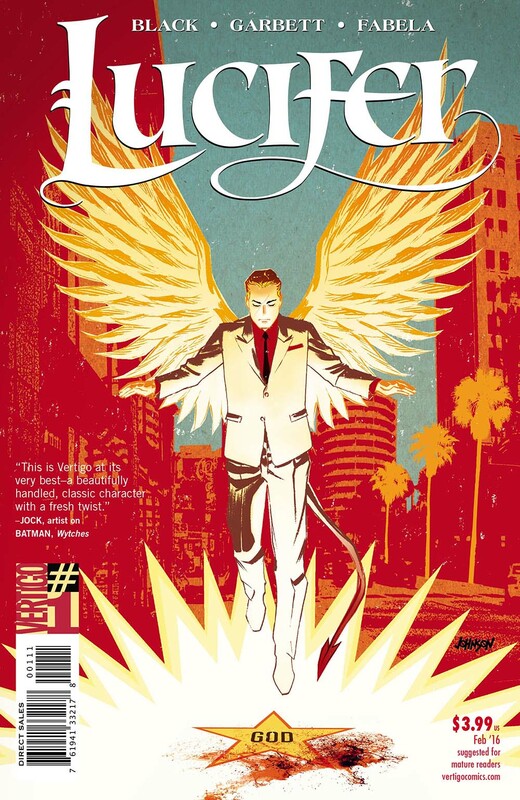 Lucifer is uber-suave and darkly eloquent, and the self-righteous angels are up to no good. Despite inklings of a pair of side stories—Hell’s got a new ruler, and a wound at Lucifer’s side isn’t healing properly for reasons undisclosed—that might go somewhere exciting, for the time being, Lucifer feels a little too cut-and-dry, a little too routine, a little like an insufficiently mysterious beginning to a deicide mystery.